Coaster Photo – Ashely Casatelli and Maggie Messina display some of the items for sale at Storehouse on the boardwalk in Asbury Park. The latest addition to the Asbury Park boardwalk is Storehouse, a store for home accessories in the Fourth Avenue Pavilion. 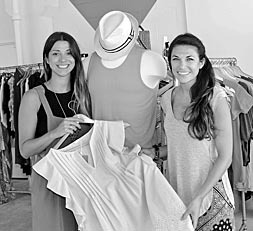 It’s not the kind of store you’d expect to find on a shore boardwalk and that’s the whole idea, according to Teeter Sperber, manager of Storehouse and it’s sister business, the Market which opened last summer. Both businesses were created by boardwalk developer Madison Marquette and are essentially several businesses housed under one roof, all with different owners. “The whole concept was created by Amanda Di Robella at Madison Marquette,” Sperber explained. “She came up with the concept and curated the merchandise selection” as Madison Marquette wanted to put unique retail on the boardwalk. Walk through the door at Storehouse and you’ll understand what they mean. The merchandise is displayed on tables and racks by merchants that also have traditional brick and mortar stores. For example, International Playground from Soho selling Fashion Forward clothing and accessories. Interwoven sells men’s and women’s clothing and accessories and grooming products and Amelia from Oxford, Ms. features unusual houseware. In addition, a locally based business called Glide which specializes in surfing and surf-oriented beach wear is there. The business also has a store on Bangs Avenue in Asbury Park. Storehouse was created this year following the successful opening in 2015 of the Market at Fifth Avenue which features the handmade creations of 40 to 50 artists and designers in what Sperber calls “an incubator for talent.” This year, The Market moved to a spot inside the Convention Hall Arcade. One of the vendors in the Market last year, Sweet Joey’s, a designer of custom jeans with a store on Bangs Avenue, was so successful that he was given his own space in the Convention Hall Arcade this year. Sperber says the idea is mainly to create a cultural cachet for Asbury Park to attract high design clientele to the boardwalk. It’s not just the vendors that provide a unique shopping, experience, she said the employees are a diverse group as well. Sperber said both Storehouse and The Market will be year-round boardwalk destination attractions.